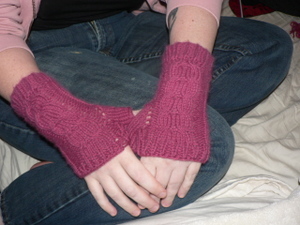 Rose colored Lush angora, matches the Twisted Maiden Fingerless gloves. Super soft, although it's oddly a bit big. 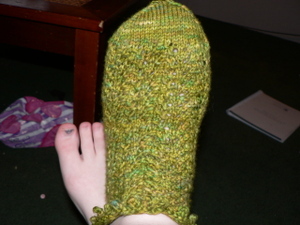 I don't think I have a small head, but I didn't gauge swatch it. Hasn't everyone knit this by now? Well, here's mine. I'm growing my hair out, so this may see more use next winter than it did this one. 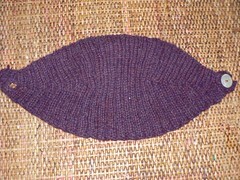 The color is actually more of a burgundy than the plum it photographed as...I have friends requesting a few of these, so they may be holiday gifts next winter. I am typically not a red girl, but have developed an odd need for a red summer sweater. 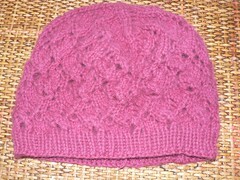 This is Anna Bell's Cherry in Moroccan red cotlin. 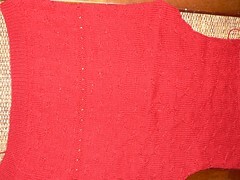 The back is finished, the first of the fronts in progress.